For me having air conditioning is a necessity. My family and I live in southern Kansas. For those of you who do not know or who are not familiar with the area Kansas gets VERY hot during the summer months. The Fahrenheit starts to creep up in May and then with each passing week it goes higher and higher until we are in July and we have nearly two months straight of one-hundred degree heat. It is not a fun time, I can assure you. During these months the only times I usually go outside are either to mow the yard or to jump in the pool. (That’s usually done in that order!) I cannot imagine going without air conditioning. Now, you may say that I am spoiled but let me tell you folks it is tough. It is especially tough when it is so hot outside that your air conditioner can’t even keep up with the set temperature. Suffer through the summer with fans and open windows in a sweaty and drippy mess. Pay, or do it themselves, to have their home retrofitted with ducts and to have a central air conditioning system installed. I can’t even imagine how pricey that is. The third option, and what most everyone does, is to purchase a window air conditioner. Depending on the size of the home some people purchase two or three of these products to get their whole home feeling cool and adjusted during the peak heat days. Window air conditioners are a great great product that give so many people a chance to access cool air. I don’t care if you are out in the country in farm land like me or if you are in an urban sprawl in Miami. Everyone needs air conditioning and these window units allow just that. Introductory costs on a new small unit can be as low as one-hundred dollars. If you compare that to the cost of a central air conditioner there is just no contest. Even in the most dire of circumstances most people can scrimp and save for a one-hundred dollar purchase. The problem here is that while these air conditioners sell like crazy during the summer months many people don’t know exactly what they are buying or what kind of air conditioner they really need for their home. 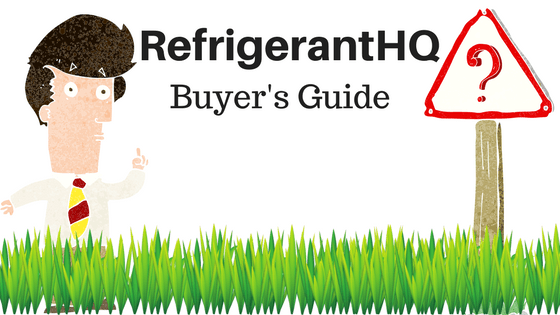 This buyer’s guide is going to solve just that. We are going to go in-depth into all considerations that have to be made before you should purchase. On top of that we are going to go through all common room sizes, determine what size your of air conditioner your room needs, and we will recommend two or three products for your room from Amazon.com. I will warn you now that this may be a long read but I can assure you folks that it is worth it because when we are done you will be an educated buyer and you know exactly what kind of unit you need for your home to keep you and your family cool. Remember how I said above that there are number of considerations that have to be made before you can purchase? Well you will be surprised at just how many options and sizes there are out there when it comes to window air conditioners. When I list these considerations I am going to arrange them by most important to least important. So, if you get anything out of this section please please please pay attention to the first three points. No really, it does. Your windows size does matter. What were you thinking? Just think about this. You buy your new window air conditioner. You got the exact sized system you needed. You are ready to install. You open your window and began to slide the new system in only to realize that your window is too narrow and won’t accommodate the air conditioner. I can only imagine the frustration of this happening and truth be told I can see myself making this kind of mistake. We all know that old rule, measure twice and cut once. Well the same rule applies to air conditioners. Always always always be sure to measure the width and the height of your window to ensure that the air conditioner that you will be buying will fit and will fit correctly. To get even more specific you may even take into consideration the depth of your new AC unit and see if there are any trees, shrubs, or anything else that could obstruct exhaust flow of your unit. Remember folks, that heat has to go somewhere and if there is something obstructing your exhaust your air conditioner isn’t going to have a good time. As I said before it is best for you to measure the window so you know exactly what you are dealing with but I will give you this bit of advice. Most windows found in homes today range between twenty-four to thirty inches wide and forty-eight to fifty-six inches high. If you are unsure of the dimensions of the air conditioner you are wishing to buy either on Amazon or the manufacturer’s official product page will have the full details for you. First and foremost before we get into what kind of unit you need we need to understand how sizing in air conditioning system works. It is not as simple as just picking the biggest and baddest model on the market. If you purchase a window unit that is rated to cool one-thousand square feet and you put it in your one-hundred and fifty square feet office your air conditioner is going to have difficulty extracting the humidity from the air as well as evenly distributing the cooler air. The end result will be hot and cool spots throughout the room. That isn’t even mentioning the increased monthly cost to run a much larger machine then you needed in the first place. This will leave you feeling frustrated due to the hot and cool spots as well as paying more money per month then you should be. Now, if we do the inverse of this scenario and buy a smaller air conditioner for a much larger area your unit will be running constantly all day and night just trying to keep up by cooling the larger square footage. This will result in the room not being as cold as it should be as well as significantly increasing the energy bills for running your AC non-stop. Remember folks, air conditioners are supposed to hit a desired temperature, turn off, and then turn back on when the temperature begins to rise. If they are running constantly that means higher bills as well as quicker parts failure on the unit. To understand air conditioner sizing you need to understand British Thermal Units, or BTUs. If you have already been looking online or in stores you have probably noticed that window air conditioners always have a BTU number in their description. As an example, Frigidaire’s FFRA0511R1 5,000 BTU air conditioner. BTUs are the traditional measurement unit of heat. In the air conditioning world BTUs are a measurement of the cooling capacity of your window air conditioner. The bigger the number of BTUs the more powerful and the higher cooling capacity of your A/C unit. As a standard measurement an air conditioner needs around thirty BTUs for each square foot of living space that you wish to cool. Using that standard measurement let’s do some match based off of the 5,000 BTU rating example we pulled from earlier. So, a 5,000 BTU air conditioner will cool a one-hundred and fifty square foot room with ease. For those of you who do not know an average sized bedroom or office is about one-hundred and fifty square feet. If you were looking to cool a bedroom, small office, or a dorm room then a 5,000 BTU system is just the one for you. However, if you were looking to cool a larger room, even if it is only two-hundred square feet it would make sense to go up to a 6,000 BTU system. Remember folks, it is a fine line to get the ‘perfect’ sized air conditioner for your room. To ensure that you are buying the right sized air conditioner for your room it is best to measure it. I can give you standards and guidelines all day long but only you know the size of your room. 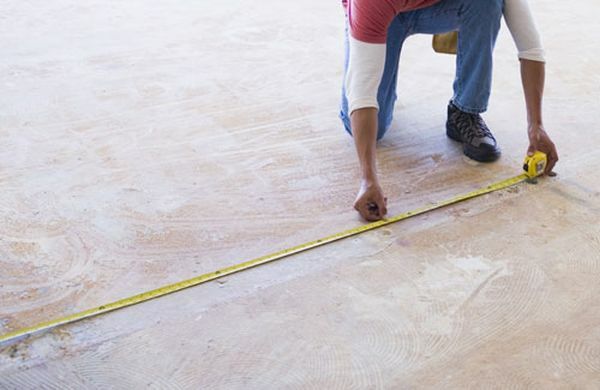 To get the square footage of your room measure the width and depth of your room and then multiply the numbers together to get your square footage. As an example if you have a ten foot by eleven foot room you have one-hundred and ten square foot. There are also other considerations when looking at your room. Yes, the size of the room definitely matters but these other scenarios could have a play into what kind of air conditioner you should purchase. The first being is your room sunny for most of the day? If so then we at RefrigerantHQ recommend increasing your required BTUs by ten percent. After all, your unit is going to have to work harder to make up for that direct sunlight. How many people will be in this room through out the day? One? Two? If it is anymore then two then it is recommended that you increase the required BTUs by six-hundred per additional person. There are times where I’m stuck in a conference room during the summer with ten people in it. It doesn’t take long for the once cool room to become hotter and hotter. The more people in a room the more power you need! How tall is the ceiling in your room? Is it a standard seven foot or eight foot celing? If so, then no problem. However, if you are working in a vaulted ceiling room or even something as high as ten foot then you may end up wanting to go up a size in BTUs. A taller ceiling means more space in your room and more space means more space to cool. The last consideration to make is will your unit be used in a kitchen? If so then we recommend increasing the required BTUs up by four-thousand. (You’ve got to accommodate for all that heat from the oven.) This one is rather obvious. There are ovens in the kitchen. Ovens are hot. You have more heat to displace now because of the kitchen appliances. If you will be buying a smaller air conditioner then this will most likely not apply to you but I would be amiss if I didn’t at least devote some time to this. Most of your smaller air conditioners in the ranges of 5,000 BTUs upwards to 10,000 all come with a standard one-hundred and fifteen voltage plugin. For those of you who do not know a one-hundred and fifteen plug is the standard outlet connection that you have in your house or apartment. 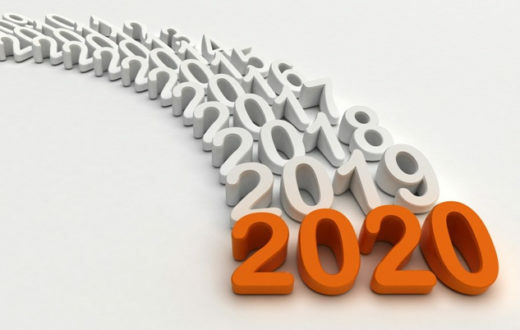 You will notice however that as you go up in size in BTUs like 12,000 or 15,000 you will start to see products coming with a two-hundred and twenty volt connection. Typically a two-hundred and twenty volt connection is only found in a couple places in a standard home, your oven and your dryer. The reason for this is that these two appliances take a substantial amount of power to operate. The same can be said with more powerful window air conditioners. If you plan on buying one of these higher BTU window units then I will warn you now to check if it is a one-hundred and fifteen volt or a two-hundred and twenty volt model. I would hate for you to purchase one of these, install it, and then go to plug it in only to realize that you do not have the right outlet available. I don’t know about you but I would be frustrated. On that same note it behooves me to mention that along with the outlet type another key factor to consider is the length of the cord that comes with the unit. Most units that I have seen come with a six foot cord. Depending on the setup and where your window lies this could be more than enough. Worst case if your cord is too short you can always use an extension. 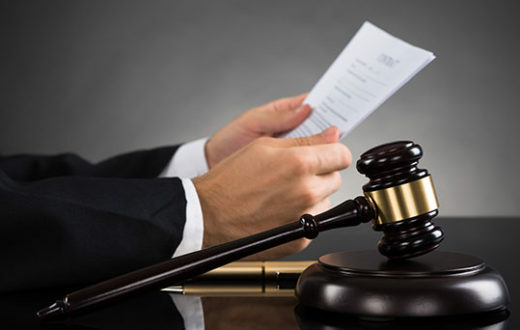 Depending on your budget the cost consideration may be the most important. Window air conditioners can range in prices from one-hundred dollars all the way up to over one-thousand dollars. The good thing here is that once you know the square footage that you aim to cool and you know the BTUs that you need it becomes a whole lot easier to narrow down your search. Why is there such a large price difference between these two products made by the same company? Well folks it all comes down to quality and features. This more expensive model, the FFRE05331Q1, comes with a remote control, a digital display, a continuous temperature monitor, a longer cord, twenty-four hour on/off timers. I could go on and on. The question that you have to ask yourself is are you willing to pay for those extra features? Or, are you content to have a basic unit with no remote? Remember now, that this basic unit will still do what it is supposed to do. It will still cool your room. I will leave this decision up to you. While most people tend to think about the upfront cost of purchasing a new window air conditioner there is another side of cost that is often overlooked. We all remember the days as kids when our parents would yell at us for leaving the front door or window open during the summer. There was a reason for this. By letting that hot air into the house your air conditioner has to work harder which results in a higher power bill at the end of the month. What temperature you have the air conditioner set at. If you are keeping your home cooled at sixty-four degrees in the dead of summer then expect to pay a lot per month! What climate you are in. Rather you are in Miami or Rochester makes a heck of a difference to your monthly power bills. I’m not just talking heat either, the humidity in the ‘tropical’ states like Florida is something to be reckoned with and will make your air conditioner work that much harder. This one should be obvious, but I will mention it anyways. The larger the air conditioner the more you will pay more month. As an example a 5,000 BTU unit will cost a lot less to run than a 10,000 BTU unit. How often will you be running the air conditioner? Is it just going to be in your bedroom and you run it while you are sleeping? If so you will save quite a bit of money. However, if you are going to be running it all day then your bill is going to go up. Lastly, if you are cooling an individual room are you keeping the door to the hallway closed? If connected to a bathroom are you keeping that door closed as well? The more sealed the area the less your AC has to work and the less you have to pay. While I cannot give you an exact estimate of how much your air conditioner will cost to run based off of the above factors what I can tell you is to look at the ‘Energy Guide’ sheet that come with your air conditioner. When shopping for a window unit most of the time the Energy Guide will either be on the box or as a picture if you are looking at Amazon.com. For example, let’s take a look at the Frigidaire FFRA0511R1 5,000 BTU unit on Amazon.com. You will notice that one of the pictures has a completely yellow background. This is your Energy Guide. 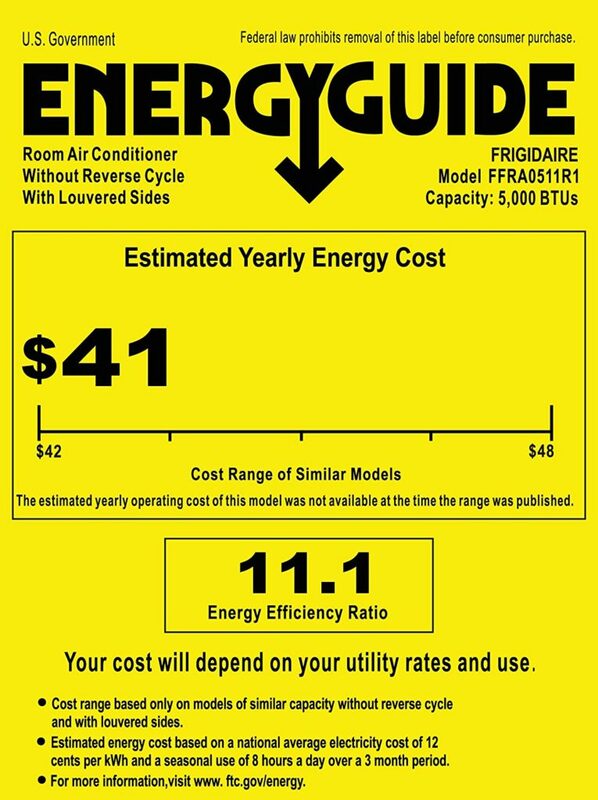 The Energy Guide will give you an estimated yearly cost to run the air conditioner. In this example the yearly estimated expense is forty-one dollars. If the product you are looking for does not have a picture of the estimated costs or it is not on the box then I would recommend checking out the manufacturers website to find the information. The last thing I’m going to mention before the next section is the Energy Efficient Ratio (EER) rating of your window air conditioner. EER is a measurement of how many BTUs the unit uses for each watt of power consumed. In other words, it is a measurement of how efficient and how much energy your ac unit uses to cool the room. 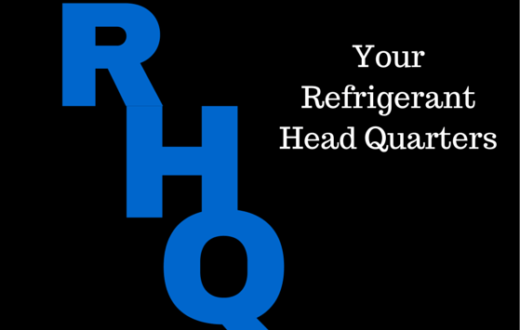 The higher the EER number the more efficient your air conditioner is. The standard EER for most air conditioners is set at 10.0. The Frigidaire FFRA0511R1 is rated at 11.1 EER. This number is also displayed on the Energy Guide sheet of your new air conditioner. So, again the Frigidaire FFRA0511R1 is a very efficient and cheap unit to run. Something else to take into consideration when it comes to air conditioners is if they are Energy Star Certified by the Environmental Protection Agency. When a product is Energy Start Certified it means that that product has met strict energy efficiency guidelines set fort by the US EPA. A Energy Star certified unit will have higher seasonal energy efficiency ratios as well as having improved energy efficiency ratios. Remember how we mentioned energy efficiency ratios (EER) earlier? Lastly, a certified AC unit will use up to eight percent less energy than non-certified one. While Energy Star certification is mandatory for AC units there are some consumers out there who prefer to only buy certified appliances. Again, this decision is up to you. Most of the time the product that you are looking at will advertise if they are Energy Star certified. It will be listed on the box or in the description of the product. If you do not see it listed then you can most likely assume that it is not certified by the EPA. 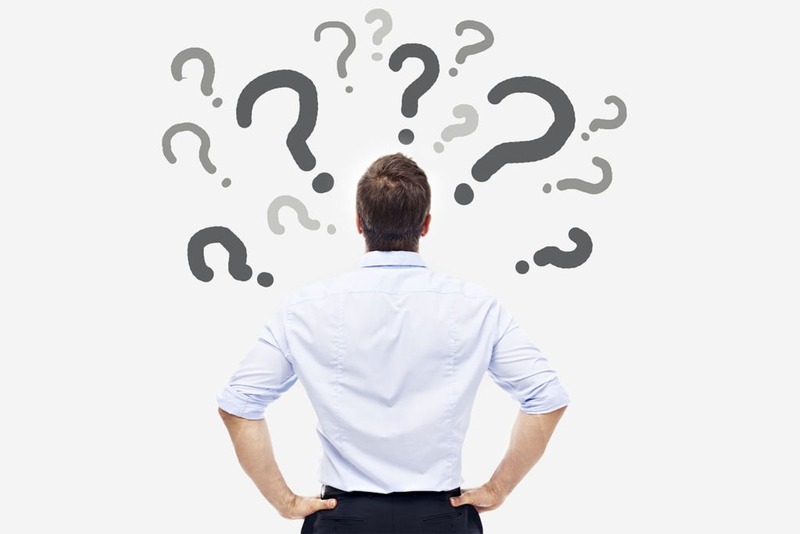 Ok folks, so we now have an understanding of what goes into picking an air conditioner and what requirements have to be considered before you can move forward with a purchase. What I want to do in this next section is to provide you with an estimated square footage, a room type, a recommended BTU size, as well as a two or three recommended window air conditioner units for each application. Using the below suggestions as a guide will set you in the right direction of picking the right system and experiencing the relaxing cool air blowing in your face on a hot summer’s day. If you ask me there’s nothing better then coming in from mowing the yard and having a cold beer in a nice cold house. Alright folks now we are truly onto the master bedrooms. Depending on the type of house you have your master bedroom will most likely fall into this range if not a little bigger. My house has the master bedroom above our two car garage. While I hate that design due to the heating and cooling issues I love how big the room is. For this room size we would recommend getting a unit in the 7,000 BTU range. Here’s the problem though when I was writing this article I just couldn’t find any 7,000 BTU air conditioners. I found the 6,000s and the 8,000s but no 7. This may just be a weird size. What I am going to do here is recommend three products here but I have to remind you to please watch your room size. If you are on the upper end of this range then you should get an 8,000 BTU but if you are on the lower end then you should be fine with the 6,000 BTU. The sizes just keep getting bigger! We are now in the territory of larger master bedrooms and living rooms. The recommended BTU for this room range is 8,000 BTUs. But, I do want to mention that as we get into these room sizes a few things start to happen. With these larger rooms you usually find higher or even vaulted ceilings. That means that you have more to cool and may consider going up a size in BTU. Along with higher ceilings you can often find living rooms open up to other rooms like the kitchen or dining room. If you have a large open floor plan you may also consider going up a size in BTUs. Remember that weird 7,000 BTU size that we just couldn’t find on the market? We ended up referring to a 6,000 or an 8,000 BTU model. Well folks, I’m going to have to say the same thing for this room size range. We would recommend 9,000 BTUs here but again, I just can’t find a 9,000 BTU model. Instead I am going to ask you to use your best judgement here and really take the size of your room into consideration. Look at the ceilings. Look at open areas. Look at sunlight shining into the room. Take all of these into consideration and then determine if you either need the 8,000 BTU or the 10,000 BTU model. Ok, folks we are moving right along. Now we are getting into the big ones out on the market. With these larger rooms comes the need for more power. The recommended BTU size for this room range is 10,000 BTUs. These rooms are you larger living rooms or even great rooms that you would find in more expensive homes. The other option here for this room size are hotel rooms. Think about it. When you check into a decent hotel there’s enough room to walk around in, sit down on a couch, a nice large bed, and sometimes even a small kitchen. The 10,000 BTU size is the perfect fit for cooling an individual hotel room. The numbers keep climbing. This category we are starting to get into standard apartment sizes. Depending on where you live the 450-550 square footage could be the average size of a studio apartment. The preferred size for this room range is 12,000 BTUs. As we get into these larger sized window air conditioners I need to mention a couple things. Obviously, the cost on these are going to go up with the increase of BTUs. A 6,000 BTU is going to be much cheaper than a 12,000 BTU. It’s just simple math. The other point I wanted to make that on some of these larger BTU sizes come with a 220 volt plugin rather than the standard 115 volt. Please please please be sure that you buy the 115 model. 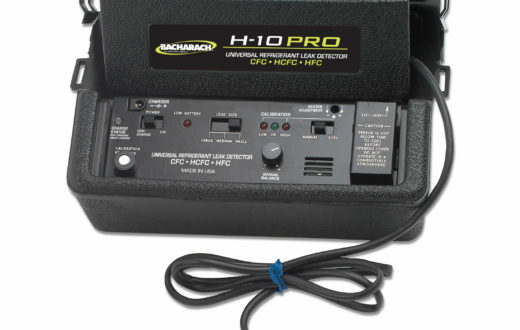 If you do have a 220 outlet available then by all means buy a 220 model, but I just wanted to warn you about this possibility. The preferred products below for our 12,000 BTU category are all 115 volt outlets Except for the Koldfront model. Well folks we all know that there are larger rooms out there than just five-hundred and fifty square feet. With the larger rooms come larger BTUs but the problem that I am running into here is that window air conditioners over 12,000 BTUs are very difficult to find. What we end up running into is that instead of window air conditioners we see the larger 14,000, 18,000, and even 20,000 BTU models come as portable air conditioners. Portable air conditioners function practically the same as a window air conditioner except that they come with a hose that you route outside the building either through a window, vent, or door. (There has to be a place for the exhaust to go.) I won’t get into all of the details on portable air conditioners in this article but I will give you a short summary of square footage, room types, and the preferred BTU size. Look into a central air conditioning system for your home. Yes, they are expensive but if you are looking to cool a larger area of your home, or all of your home, then this may be the best solution to maintain a reliably cool and balanced temperature. If central air conditioning is not an option then I would use my guide above and purchase two, three, or however many window air conditioners that you think you may need to cool your home. My father in law has an older ranch home with no routed central AC. He has three window air conditioners installed in the home: One in the bedroom, one in the dining/kitchen, and one in the living room. Having these three units going at the same time help to maintain the overall temperature in the home and provide him with a level of comfort. Koldfront WAC18001W 18,500 BTU – Rated up to 1,000 square feet. Frigidaire FFRE2233S2 22,000 BTU – Rated up to 1,300 square feet. Koldfront WAC25001W 25,000 BTU – Rated up to 1,500 square feet. You may have noticed in the above section that when I recommended products there was one brand name that I always included in my top three picks. That brand name was Frigidaire. There was a reason I did that. If you haven’t heard of the company name Frigidaire before I have to ask where have you been? These guys have been around for over one-hundred years and were in fact one of the pioneers in the early refrigeration industry. One of their principal investors was Willam Durant, a founder of General Motors. GM went on to develop the first ‘Freon’ refrigerant in the 1930s while they were partnered with DuPont. On top of all of that Frigidaire invented and began selling the first self-contained refrigerator in 1916. They have been around ever since manufacturing and innovating on new appliances. The point I’m trying to make here folks is that Frigidaire knows what they are doing when it comes to air conditioners and refrigeration. Don’t shy away from this company. They make great products and stand behind them. If I was to buy an air conditioner today it would be from Frigidaire. Regardless of what size you need window air conditioners are a great addition to the home and offer people from all over the country a cheaper and obtainable way to access cool air during the summer. As a product I love these things. They give every walk of life access to air conditioning. A regular split system air conditioner can cost anywhere from two or three thousand dollars. You can get a window unit for a tenth of that cost. I don’t care if your living in a tiny studio apartment in an urban sprawl or if you are out in the middle of nowhere in a one-hundred year old farmhouse window air conditioners will work for you. In fact every time I see one of these units sitting in a window I can’t help but think of an older farmhouse. The house may be decades old but not much has changed. The barn is still up. The original woodwork still adorns the stairways and baseboards of the house. Everything look as it did except one or two window air conditioners resting outside the windows. I’ve always been a country guy at heart and seeing those air conditioners hanging outside a farm house gives you that country feel along with the conveniences of modern life. That’s enough of that though as I’m getting a little bit off track. 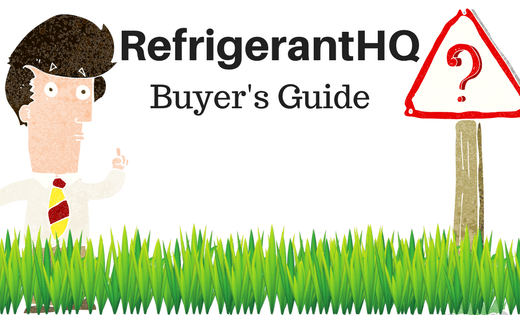 So, anyways, I hope that this guide was able to help you find the exact right kind of window air conditioner for you and answer any and all questions that you had. If I missed something or you feel that something is incorrect please do not hesitate to reach out to me by clicking here.